Considering the massive number of new commercial properties springing up all over Sugar House, Millie's Burgers (2092 S. 1000 East, 801-466-6043) provides an interesting contrast. Mere blocks from flashy, modern concept restaurants, the 40-year-old family-owned burger joint seems unfazed by the surrounding urbanization. It's a confidence that stems from the fact that Millie's has maintained a loyal fanbase because of its fresh ingredients, made-to-order burgers and colossal menu. In nearly every way, Millie's has maintained the nostalgic sensibilities established by Marlene and Howard Miller, the restaurant's original owners. 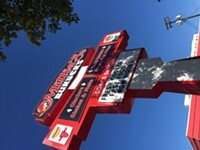 A backlit letter board lists the restaurant's menu, which contains everything from garlic burgers to burritos. The interior space wasn't designed to hold more than 40 people, which makes finding a seat during the winter months a bit of a challenge. 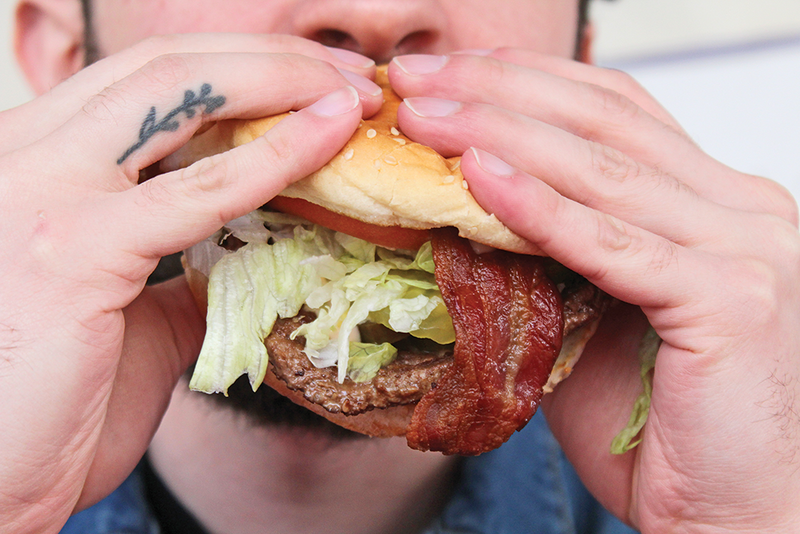 Once it gets warmer, the patio offers more than enough room to enjoy a burger and some top-notch people-watching. 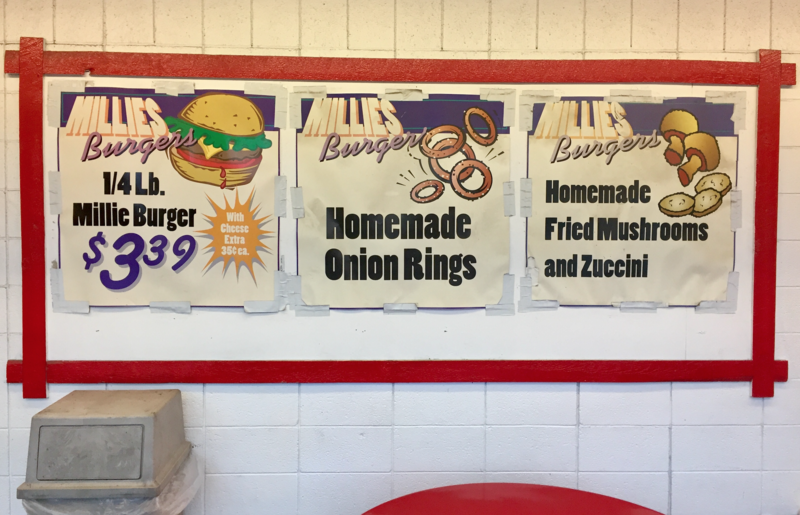 I've been a fan of Millie's ever since college, but it wasn't the burgers that captured my attention. The frozen treat that first brought me inside its cozy confines is called a glacier ($2.69). Glaciers at Millie's are so good and inventive that you have to wonder why more places don't rip off the idea. It starts with a cup full of Millie's soft serve, topped with a traditional slushie mixture—shaved ice fine enough to drink through a straw, plus your choice of flavored syrup. The frozen all-star duo collides in an unexpectedly delicious way. First, you get the sharp, saccharine tang of whatever syrup you've chosen—my favorite is strawberry, but there's not a bad choice. This sharpness combines with the creamy texture and light hint of vanilla from the soft serve until you get a fruit-and-cream tango that hits the tongue in all the right places. There's also a pleasant, cerebellum-chilling shock of having two types of frozen goodies in your mouth in tandem. It's a cold-on-cold treat that needs to be in your emergency kit when temperatures hit 90-plus degrees. Subsequent visits found me checking out their impressive list of side dishes, which consist mainly of different iterations on fried vegetables. French fries and onion rings are the most popular, of course, and Millie's can fry up these two favorites with the best of them. For something more unusual, give the fried mushrooms ($2.99), fried zucchini ($2.99) and traditional English chips ($3.59) a go. They're all great—golden brown and crispy with an undeniable freshness beneath the layer of deep-fried crunchiness. As my introduction to Millie's was based on the fringes instead of the menu proper, it's been a while since I've tried one of their signature burgers. During my last visit, I got the Millie Special ($6.09), which is the restaurant's take on the ubiquitous pastrami burger. There's nothing inherently wrong with this version, but it lacks the punch of other pastrami burgers in town—there's just not enough pastrami to keep the taste buds awake. If you're in the mood for something that offers more of a kick, the bacon Swiss jalapeño burger ($5.44, pictured) is the way to go. The peppers' heat and bacon's saltiness are offset by the creamy cheese, and combined, the ingredients offer up a truly fantastic flavor overload—plus, ordering one of these fireballs is a great excuse to explore the extensive repertoire of milkshakes. Millie's menu displays these frozen classics in three tiers, depending on what flavor you're after. A mere $3.99 will get you the basics—chocolate, strawberry, mint—but if you really want to ratchet things up, their $4.59 tier includes more sophisticated combos like caramel cashew and banana pie. For those who want to mainline their nostalgia, an additional 35 cents gets your shake a shot of malted milk. Millie's shakes are moderately huge, and the traditional flavor combos are well integrated throughout the ice cream, but there's not much that sets them apart from those of their burger-joint cousins. All the same, kudos to Millie's for doing what it's doing. Throwback eateries like this remain important community hubs where many different generations of Utahns can meet up and get to know one another. With all the fast-moving development in the Sugarhood, it's a singular treat to pop into Millie's, order up a glacier and let life slow down to the speed it takes to eat it—without getting brain freeze. Open: Monday-Saturday, 10:30 a.m.-9:30 p.m.